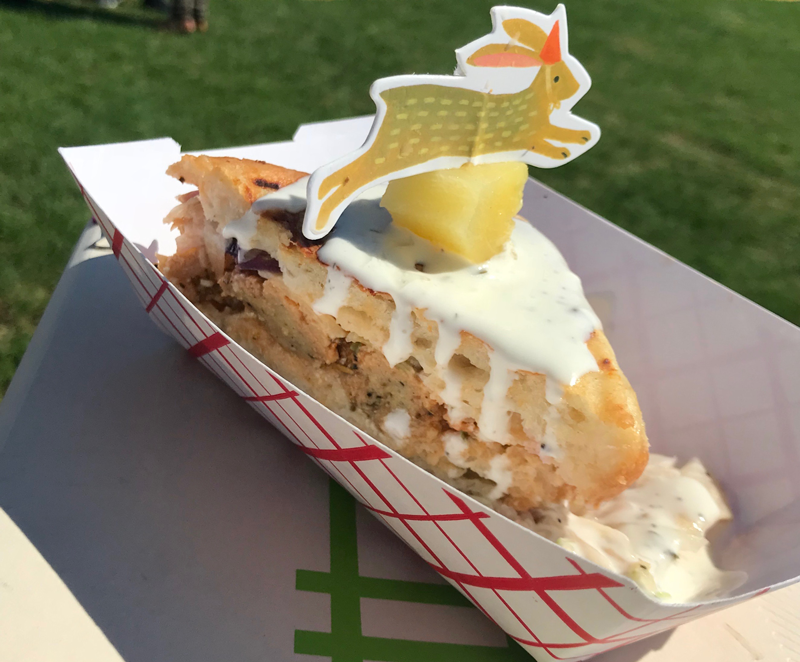 From flaming aquafaba to plant-based brisket, the Vegandale fall festival delivered the ultimate vegan fantasy foods. 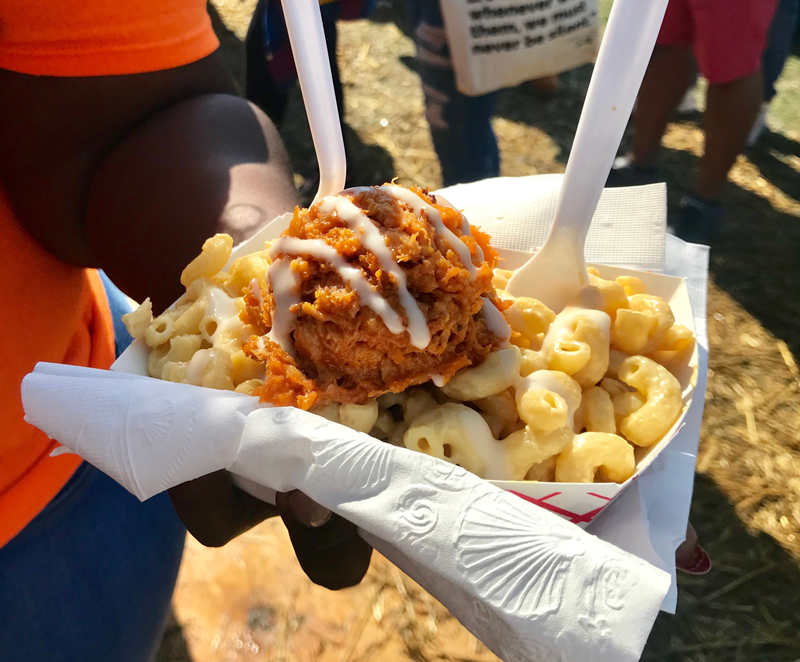 Part vegan neighborhood, part plant-based revolution, Toronto’s Vegandale—an entirely vegan neighborhood—temporarily transported itself to New York City’s Randall’s Island Park for a massive two-day celebration of cutting-edge, cruelty-free cuisine. Vegandale is a stretch of street in a quiet Toronto neighborhood that has become an enclave of vegan culture, featuring cruelty-free restaurants and shops. At the Vegandale Food and Drink Festival, more than 100 vendors delivered plant-based fantasy foods, from abundant burgers to dressed up desserts, and everything in between. Less than a year old, Majestic Dough has answered the call of vegan cookie dough-lovers everywhere who demanded a cruelty-free version of their favorite treat. The company’s sweet and rich dough combines vegan butter, almond milk, sugar, and flour. 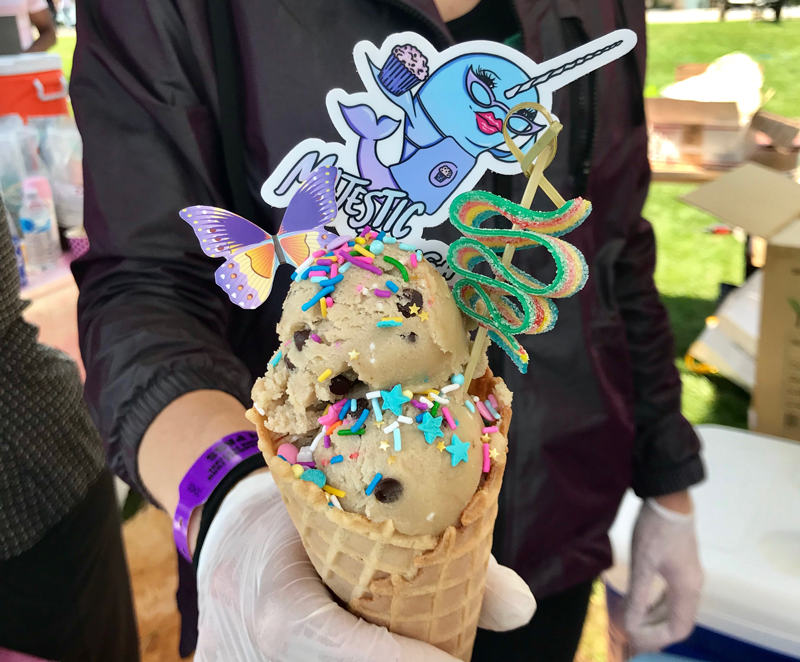 Festival flavors included cake batter, Oreo, and oatmeal with candy-coated chocolates (similar to M&Ms), scooped into a cup or cone, with vegan sprinkles. It was all topped with a paper butterfly, and a cut-out of their signature glam fish. Based in Durham, North Carolina, Earth To Us is a family-owned business that launched in 2017. With roots in Puerto Rico, they offer traditional comfort foods featuring Latin flare. In addition to being vegan, their menu is entirely gluten- and soy-free. 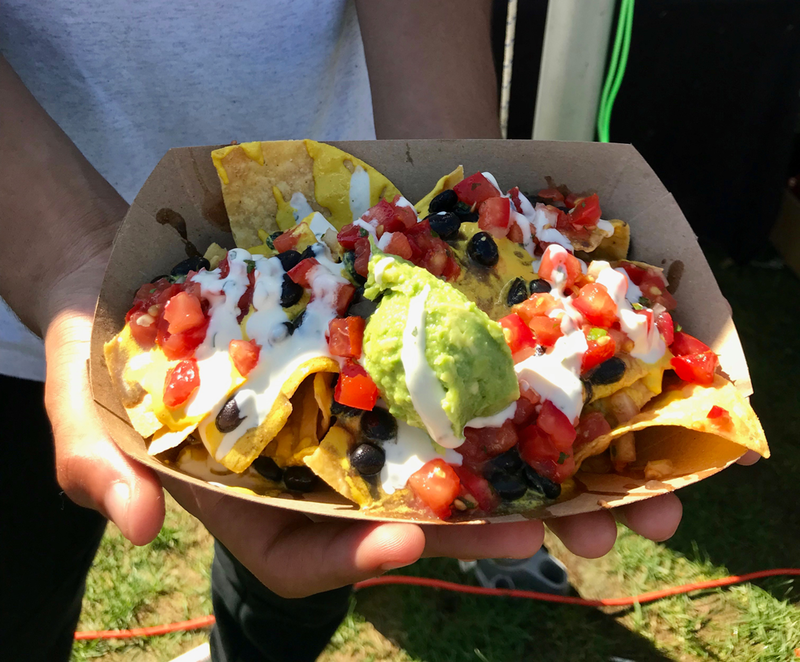 Festival-goers enjoyed their crowd-pleasing Loaded Nachos: a plate of fried corn tortilla chips, smothered in cashew-based nacho cheese, with black beans, pico de gallo, guacamole, and a drizzle of ranch sauce. Also on the menu were their spicy cauliflower wings, served battered and deep-fried, with sauce options including Bang Bang, a seasoned sriracha mayo. We all scream for vegan ice cream, especially when it’s on fire! 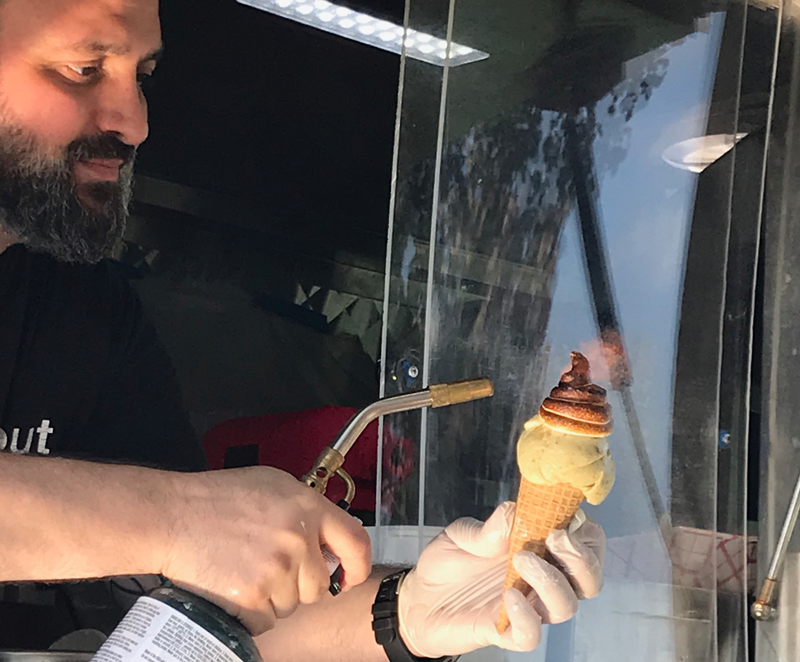 Foodies got an extra treat as they watched aquafaba being torched to form a toasted vegan meringue swirl on top of their cones at the Bona Bona Ice Cream truck. Instagrammers went wild and dessert-lovers happily tolerated long lines as they waited their turn for ice cream flavors including fig and apple crumble, as well as a decadent coconut sorbet with mango and sesame seeds. Aquafaba has never looked so good. Albany-based Berben & Wolff’s Vegan Delicatessen came downstate to show New York City they do deli just as well as the town that made it famous (and did it vegan). 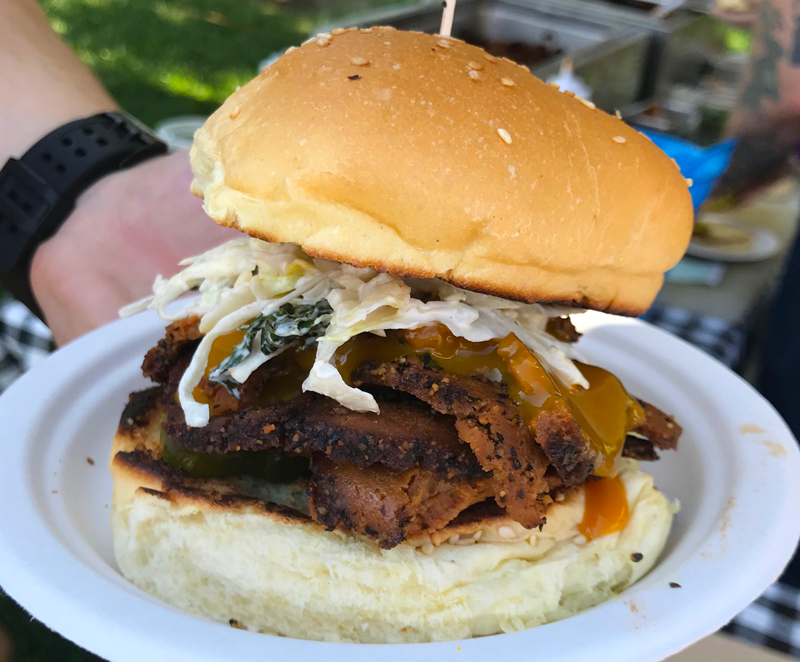 Festival-goers relished their Smoked Brisket Sandwich: a stack of smoked seitan brisket, served with charred kale slaw, pickles, and barbeque sauce, on a seeded roll. Also on the menu was their meatball parmesan slider with homemade Italian meatballs in s pepperoni bolognese, with cauliflower mozzarella. 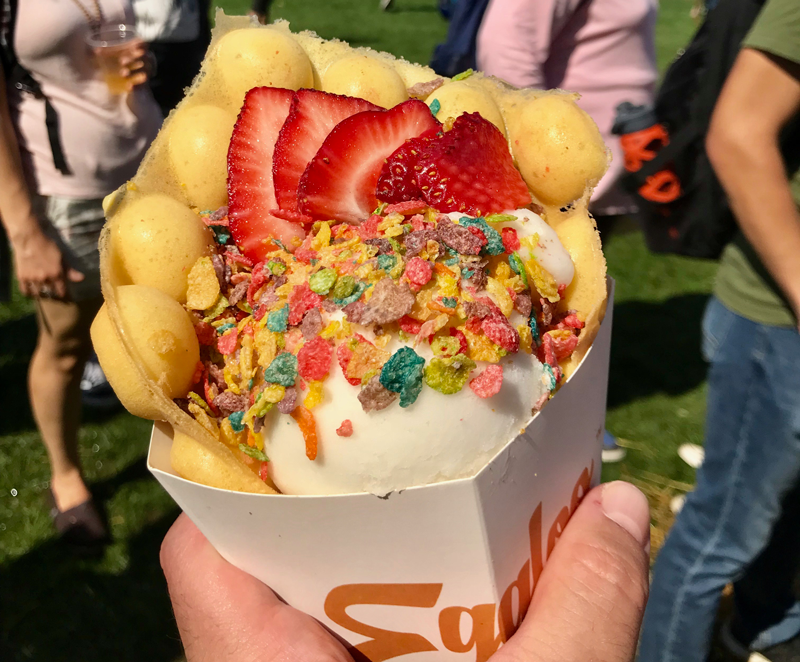 Vegandale festival foodies flipped over New York’s own Eggloo cones: vegan waffles folded and filled with pistachio or vanilla ice cream, with topping choices including mochi, juicy fresh fruits, crunchy almonds, sweet shredded coconut, graham cracker crumbs, and classic drizzled chocolate. New Jersey’s Freakin’ Vegan caterers brought the works to Vegandale and new-found fans lined up so as not to miss out. Their menu specials included Buffalo Chick’n Mac-n-Cheese with vegan blue cheese, BBQ Pulled Porkless Sliders with slaw on the side, and Sweet Corn Tamale Cakes with a grape tomato pico de gallo, and vegan sour cream. They say their food is “200 percent freakin’ delicious”—let’s triple that! Susan Tucker is a plant-based chef and the founder of Green Beat Life, LLC, a health coaching practice for plant-based wellness paths, in New York City.